PLANO, Texas, June 27, 2018 /3BL Media/ – Alliance Data Systems Corporation (NYSE: ADS), a leading global provider of data-driven marketing and loyalty solutions, today released its annual Corporate Responsibility Report for 2017, which reviews accomplishments over the past year and sets new goals for 2020 across all three of the company’s lines of business – Alliance Data’s card services business, Epsilon and LoyaltyOne – as well as the parent company. This year’s report presents an updated corporate responsibility strategy that provides a blueprint for activities over the next three years, with a focus on leveraging the company’s expertise in technology and data analytics to benefit the social good – a purpose-driven approach the company calls “data for good.” Download a copy of the highlights report or the full report. 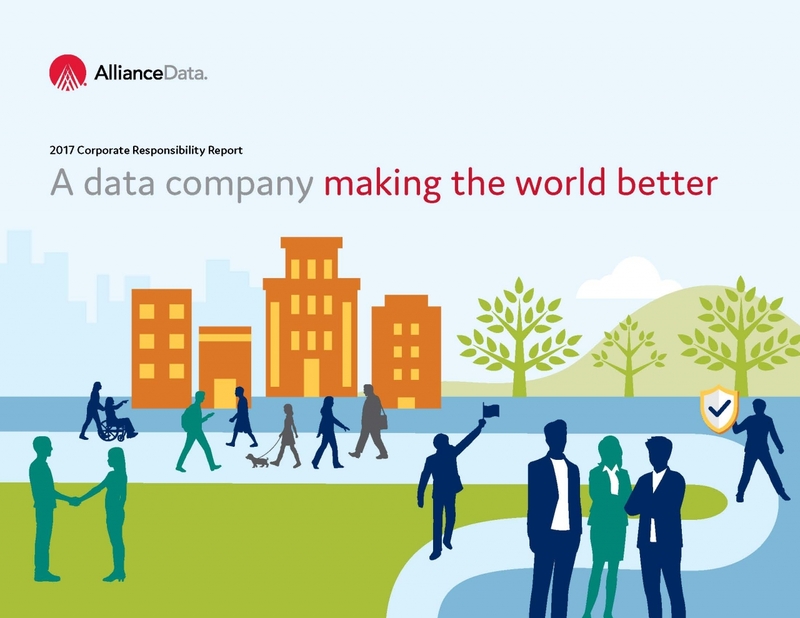 In 2017, Alliance Data evolved its corporate responsibility strategy to better reflect the company today, incorporating feedback received from stakeholders. Specifically, the company articulated its approach to fair and responsible banking; ramped up efforts to promote an inclusive and diverse workforce, supplier base and Board of Directors; and placed greater emphasis on using technology and data analytics capabilities for social good. Alliance Data invested $14 million in its communities in 2017, with $1 million of those dollars invested in minority depository financial institutions in areas affected by Hurricanes Harvey and Irma. With the company’s strong focus on community investment and associate engagement, 87% of Alliance Data associates feel encouraged to give back to their community. Alliance Data partnered with the Texas Trees Foundation to better understand and respond to rising temperatures effecting Dallas, through a combination of funding and associate volunteerism, an effort that will help improve community health and offset carbon emissions in North Texas. The 100+ vehicles in Epsilon’s smart community fleet help get 1,100 associates to work each day. Epsilon added 19 electric vehicles to its employee transportation program in 2017. The Federation for Internet Alerts (FIA) regularly relies on Epsilon technology to issue AMBER Alert messages and tornado warnings across the U.S., helping recover missing children and notifying individuals of impending weather emergencies. In 2017, FIA sent alerts that achieved a total of 1 billion impressions, including more than 12 million alerts delivered during hurricanes Harvey and Irma. Looking forward, Alliance Data’s strategy is aimed at increasing the company’s positive social impact and reducing its environmental footprint, while achieving results that strengthen the long-term sustainability of the business. The company will employ its “data for good” philosophy to drive economic return across the value chain; improve business performance for clients through the effective use of marketing and technology; create value for consumers through tailored and relevant multi-channel communications; offer a healthy, inclusive, safe and rewarding workplace; and address social and environmental issues. In the area of community investment, Alliance Data has set a goal to invest $20 million in data for good initiatives. With each grant, the company will evaluate how the use of data and technology can advance a nonprofit’s ability to deliver social impact. In terms of environmental stewardship, Alliance Data will develop a plan to set a science-based greenhouse gas (GHG) emission reduction target, establish a task force to develop protocols for GHG emissions, and will invest $5 million in efficient technologies for new buildings and retrofits to company facilities. For its associates, Alliance Data is making a concerted effort to attract and retain top talent, and create a workplace that nurtures learning and growth. The company has made great strides in moving toward gender pay parity and U.S. ethnic pay equality, and has launched specific programs in each business line to help women prepare for leadership roles. To learn more about the company’s existing corporate responsibility initiatives addressing top priorities, future goals, and progress, view the full 2017 Corporate Responsibility Report.